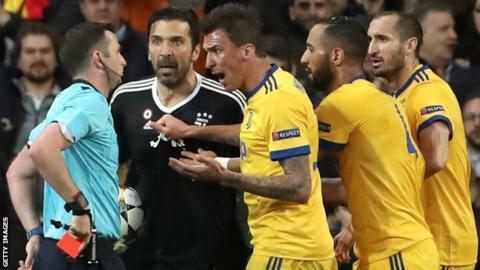 Referee Michael Oliver has “a bag of rubbish for a heart”, says Gianluigi Buffon after Juventus were knocked out of the Champions League by Real Madrid. English official Oliver awarded an injury-time penalty to Real for Mehdi Benatia’s foul on Lucas Vazquez and Buffon was sent off for his reaction. “It was certainly a dubious incident. Not clear-cut,” Buffon told Italian TV. Buffon also told Italian media that Oliver should “sit in the stands eating crisps” for “ruining a dream”. Real had led 3-0 after the first leg, but saw their advantage wiped out at the Bernabeu through two Mario Mandzukic headers and Blaise Matuidi’s opportunistic strike after Keylor Navas’ error. But with the tie heading to extra time, Oliver adjudged Juve defender Benatia of bringing down Vazquez in the box and pointed to the spot. Cristiano Ronaldo then stepped up to coolly place the 97th-minute penalty into the top corner. Buffon took his protestations too far and was given his first Champions League red card on his 650th appearance for Juve. The Juve captain said after the game: “It was a tenth of a penalty. “Clearly you cannot have a heart in your chest, but a bag of rubbish. On top of that, if you don’t have the character to walk on a pitch like this in a stadium like this, you can sit in the stands with your wife, your kids, having your drink and eating crisps. Holders Real reached the last four for the eighth consecutive season, joining Liverpool, Roma and Bayern Munich in Friday’s draw in Nyon. Star man Ronaldo made the decisive contribution, scoring his 41st goal of the season and netting in his 11th straight game. “I don’t understand why they are protesting,” said Portugal captain Ronaldo. “Lucas was tackled from behind and if they don’t give him the penalty, it is a goal. Real boss Zinedine Zidane has guided the Spanish side to back-to-back Champions League crowns, as well as a La Liga title since taking over in 2016. The Frenchman said: “They [Juventus] played well in the first leg and perhaps deserved a goal. Today it was the same for us. “They scored early on like we did there and this is football. The Champions League is the creme de la creme and anything can happen. “We were always going to suffer and be pressed high. They did that and played wonderfully well and their coach’s plan worked. Juventus coach Massimiliano Allegri added: “Games like these are great moments against the biggest clubs in the world. We want to be the best.